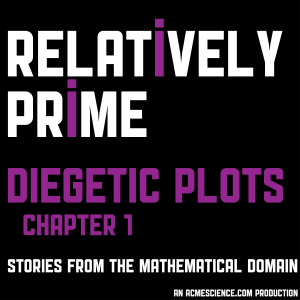 This episode of Relatively Prime is going to be delving into the humanistic side of mathematics. It is the first chapter in a recurring series Samuel is calling Diegetic Plots. Yes that is a super nerdy joke, and yes Samuel is super proud of it. Gizem Karaali is an Associate Professor of Mathematics at Pomona College and an editor of The Journal of Humanistic Mathematics, a journal which looks at mathematics as a human endeavor with am emphasis on the aesthetic, cultural, and sociological aspects of mathematics. She read her poem The Colors of Math. Ted Chiang is a multiple Hugo and Nebula award winning science fiction author. Among his work is an amazing bit of math-fiction titled, Division By Zero. Samuel talked to Ted about where the idea for the story came from and what it was like to write about such an abstract mathematical idea. You can find the story in Ted’s short story collection Stories of Your Life and Others where you will also find a lot of other wonderful stories to read. The interview is followed by a reading of Division By Zero by Jess Charlton, Kitty Stoholski, and Samuel. A black hole appears over Samuel’s desk as he tries to introduce the next segment and what appears is frightening. Stuart Rojstaczer has been a dishwasher, a college professor, and a grade inflation czar. He is now an author who’s debut novel was published in September 2014. The novel, The Mathematician’s Shiva, is the story of Rachela, the greatest mathematician of her age. It tells the story both of her time in a Soviet Gulag as a child and of the aftermath of her death. Samuel talked to Stuart about how he prepared to write about mathematicians, the importance of balancing all of one’s identities, and a little bit about Navier-Stokes. ####While the interviews in this episode Relatively Prime are licensed with a Creative Commons Attribution Share-Alike license, the authors reserve all rights for the poems and stories which appeared on this episode and if you want to reproduce or otherwise use their work please contact the authors to ask for their permission.